Flat stage for the sprinters? Yeah right! Stage 13 of this year’s Tour was the most epic day of bike racing I have ever watched. The coverage of the race here in Australia starts with a bit of chat about the Tour so far, followed by some French cultural stuff and then a brief cap on the stage up till the point that they go live. When they switched over to the race coverage it was – boom! 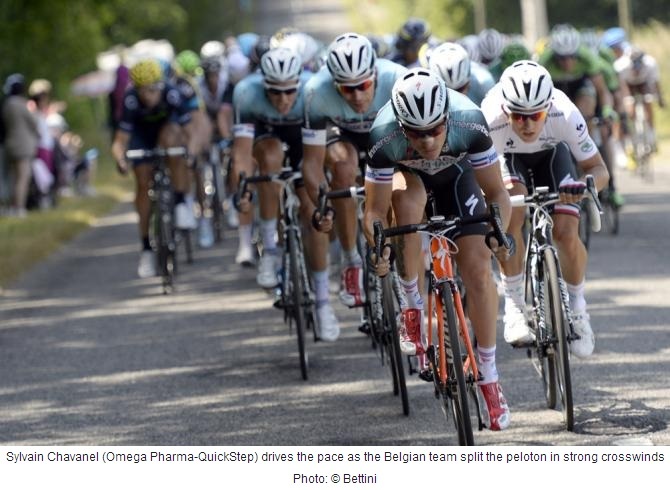 The winds caused opportunity and havoc, and it was The Manx Missile’s (Mark Cavendish) team of Omega Pharma-Quickstep who put the hammer down and caused much carnage against the peloton. Unlike last year the teams in the peloton have not been happy to just gift any jersey to their opponents. It has been a fight on all fronts with attacking plans culminating in a perfect recipe for much mayhem. On the GC front we had three teams with riders in striking distance to the Empire (Sky – boo-hiss); Movistar (Valverde, Quintana), Saxo-Tinkoff (El Pistolero, Kreuziger), and the biggest dark horse for the Tour in my opinion The Team Formerly known as Rabobank formerly known as Blanco now known as Belkin (Ten Dams, Mollema). The hunt for the Maillot Blanc has Omega Pharma-Quickstep (Kwiatkowski) versus Movistar (Quintana). And of course the sprinters were all targeting this specific stage before the Tour headed to the mountains. A proper powder keg ready to explode. There is a reason why they say that you can’t rest on your laurels in the Tour. Anything can happen, and the Froome-dog must be thinking “when am I going to cop my hiccup?” But it was the second placed GC rider who suffered. Alejandro Valverde copped a puncture soon after all the splitting action, and in a reverse in fortune (from the 2009 Vuelta a España where he profited significantly from Cadel Evans copping a puncture and him putting the knife in to attack and eventually win the GC) he was left stranded. His teammates fudged the wheel / bike change, opting for the former and he basically was left to chase a group that had no intent on waiting for him. This minor mechanical incident has basically cost the second placed rider his Tour, as he never caught up and lost 9 minutes to Froome – game over for the Spaniard who will forever be clouded by his never-admitted former drug use. It was clear that the carnage in the peloton would not have them regroup for a bunch sprint. In the lead peloton, the pace was incredible and the Empire’s riders were dropping like flies along with many others. With just over 30km to go the lead peloton were attacked by El Pistolero’s Saxo-Tinkoff team. Five of them blasted away, and the two lead riders from Belkin followed along with the Missile and The Tourminator (Sagan). This group contained 15 riders in total and were intent on attacking an isolated Froome. Saxo-Tinkoff and Belkin teamed up to basically ride the last 30km as a team time trial. The whole peloton was spent and could not match the ferocity of this attack. By the time they hit the last two kilometres of the race, they had pumped 1 minute into the Froome-dog’s lead. Belkin and Saxo-Tinkoff left the stage for the Missile and the Tourminator to fight it out. But Cav had the advantage – Chava(nel) was his lead-out man. Chava has been angry since the beginning of the Tour and has been a monster on the bike. He lead Cav out, but it was Sagan who took his wheel – this would prove to be Sagan’s tactical mistake. Cav waited for the right moment to pounce and blasted him to take his 25th Tour de France stage win. Respect! This was the most epic day of pro-cycling racing I have watched all year. The Maillot Jaune was under attack, the peloton was under attack, and there was a slew of victims left in the wake of the ride. Earlier in the day at work, and before the stage, another cycling fan asked me whether I thought the Froome-dog had it sewn up? I replied no and nominated two dark horses as the possible usurpers – Mollema and Ten Dams. This stage proved me right and it was awesome to watch! I can’t wait for the next stage, this 100th edition of Le Tour is awesome! 1. Sylvain Chavanel – was a weapon of attack firstly for the whole of his OPQ team and then specifically for Cav. 2. Michael Rogers – the former Empire super-domestique, now in the service of El Pistolero and Kreuziger. 3. Nicholas Roche – also in the service of El Pistolero and Kreuziger, and AG2R must be ruing his loss. 4. Daniele Bennati – another in the service of El Pistolero and Kreuziger. 5. Niki Terpstra – another OPQ weapon. Big respect to all these boys! For a more serious assessment of the day’s racing. My turbo training challenge ride was replaced by a weekend ride with my mate JB. The curly in my mix is that I have multiple stress fractures in my rear wheel on my road steed, basically after 4 years and much pounding from my f@t @r$e it has given in. This was not an expense that I was planning to incur – kaching ouch! So I took the mtb steed out for the 70km spin with a set of semi-slicks as shoes. I was very tired by the time I got back home, feeling the pinch of the extra weight. It wasn’t until I logged my ride online that I realised the reason for my soreness – I averaged 220W for the whole ride. I know that the pro riders hammer at a much higher level, but this is the hardest that I have ridden in my preparations for the big rides in September and October. I think it will be an easy recovery ride tomorrow morning. Easy recovery ride sounds about right. Nice job my friend. 70km on a mountain bike is a big ride. Tell you what, you can sure feel the difference. Just the weight of the wheels alone feels like you are moving lead laden rubber. New wheels on the way to reshoe the road steed. I know… I love my mountain bike, but going for a road ride on it? Yeah, haven’t done that in quite some time.